Beets and raw beet juice are typically recommended in limited amounts due to high sugar content. However, when fermented, beets may be among the healthiest vegetables out there, as most of the sugar is then gobbled up by beneficial bacteria during the fermentation process while leaving other health-boosting ingredients intact. Fermented foods are also chock-full of probiotics or good bacteria. A large number of studies have demonstrated how the ideal balance and diversity of bacteria in your gut forms the foundation for physical, mental and emotional well-being, and fermented beet juice has many additional benefits beyond probiotics. Competitive athletes also use beet juice for its nitric oxide-boosting benefits. Research shows raw beets may boost stamina during exercise by as much as 16 percent,4 an effect attributed to increased nitric oxide. 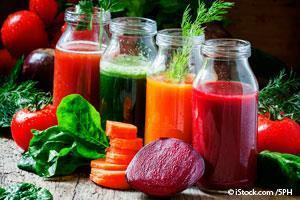 In another study,5 nine patients diagnosed with heart failure who experienced loss of muscle strength and reduced ability to exercise were found to benefit from beet juice. The patients were given 140 milliliters (mL) — about two-thirds of a cup — of concentrated beet juice, followed by testing, which found an almost instantaneous increase in their muscle capacity by an average of 13 percent. One important caveat: Avoid using mouthwashes or chewing gum, as this prevents the nitric oxide conversion from occurring.6 The reason for this is because the nitrate is converted into nitrite in your saliva by friendly bacteria. That nitrite is then converted into nitric oxide in other places of your body. Naturally-occurring betaine in beets also helps reduce inflammation and protect against environmental stressors that can play a role in heart disease. The phytonutrients that give beets their deep crimson color also have powerful anti-cancer properties. Research has shown that beetroot extract reduced multi-organ tumor formations in various animal models when administered in drinking water. In addition, raw beets help boost immune function thanks to high vitamin C, fiber, potassium and manganese, while the betalin pigments and sulfur-containing amino acids in beets support your body’s Phase 2 detoxification process. Traditionally, beets have been valued for their ability to purify your blood and liver. High in the B vitamin folate, beets may also lower your stroke risk and are an excellent food for pregnant women. Folate is essential for many bodily processes, and lack of folate during pregnancy raises the risk of birth defects. The blood-cleansing properties of beet kvass may also help alleviate morning sickness. Fermenting your beets rather than eating them raw gives you all the health-boosting benefits of raw beets — which are made even more bioavailable through fermentation — plus the beneficial bacteria and enzymes that result from fermentation. Besides pickled beets8 and beet-infused sauerkraut,9fermented beet juice, known as beet kvass,10,11,12 is rising in popularity in the West. Beet kvass has a long tradition of use in Russia, Ukraine and other eastern European countries, where it’s consumed therapeutically as a general health tonic. It’s also commonly added to soups, sauces and vinaigrettes. Traditionally, beet kvass has been used to boost immune function, cleanse blood, combat fatigue and treat kidney stones, chemical sensitivities, allergies and digestive problems. Anecdotal reports suggest beet kvass may even improve the appearance of age spots, thicken hair and minimize graying of hair. Because of its detoxifying properties, avoid drinking too much when first starting out. Doing so could result in an overload of released toxins, producing bloating, constipation and/or cold or flu symptoms. As a general recommendation, start out with 1 ounce per day, gradually increasing the amount to an 8-ounce glass per day. If you’re highly toxic, you may need to start out with as little as a tablespoon. • 2 large raw organic beets, cut into 1-inch cubes. Do not grate them, as this will release too much sugar. • Filtered water, spring water or distilled water, freshly squeezed beet juice, or a combination of beet juice and pure water. Place the beets in a large-mouth mason jar, filing the jar about one-third of the way. Add sauerkraut or pickle juice, salt and water/beet juice, leaving 2 inches of space between the top of the liquid and the lid. Cover tightly and shake well to dissolve the salt. Keep at room temperature for three to five days. In winter months, the fermentation process may take up to seven days due to colder room temperatures. Keep the lid tightly closed, but remember to release pressure daily. If froth, scum or mold develops, simply skim it off the top with a spoon. Do a daily taste test, and when the kvass has developed a pleasing taste, place it in the refrigerator to stop the fermenting process. Fizzy bubbles rising to the top is a sign that it’s ready. Naturally, the beets can be consumed as well, or you can reuse them to start another batch of kvass. The beets also make an excellent addition to traditional borscht soup (beet soup) while the kvass can be used to pickle hard boiled eggs. Some beet kvass recipes call for whey to be used,16 but it’s not really necessary and adds more steps and time to the process. Flavors can also be added,17,18 such as raisins, strawberries, fresh-squeezed orange juice, apple, carrots, lavender, fresh or dried mint leaves, cinnamon or ginger. Whether you’re juicing your beets, eating them raw or fermenting them, I strongly recommend buying organic beets. As with many other crops, most of the sugar beets grown in the U.S. are now genetically engineered (GE). While table beets are not currently GE, they’re often grown in close proximity to sugar beets, and cross-pollination is known to occur. So, when choosing beets to eat, opt for organic varieties whenever possible to avoid potential GE contamination. You can also buy your own heirloom beet seeds, because beets are easy to grow. The many nutrients and real health advantages they offer are worth it. Besides the beetroots, beet greens offer a plethora of vitamins and minerals, too. They’re a great source of fiber — 17 percent of your daily requirements in just one cup — as well as vitamin B6, magnesium, potassium, copper, manganese and antioxidants. The high amount of vitamin K in beet greens contains blood-clotting properties, fights aging, supports your DNA, helps ward off osteoporosis, works with calcium to boost bone strength, and may also play a role in fighting Alzheimer’s disease. Beet greens contain more iron than spinach and a higher nutritional value than the vegetable itself. Besides using young beet greens in salads or sautéing, juicing beet greens is another excellent way to obtain all these nutrients. As you can see, beets have a wide range of health benefits. If you struggle with high blood pressure or heart failure, you may want to experiment with raw beet juice or beet kvass and see how it impacts you. If you notice improvements in your blood pressure or stamina after drinking the juice, it may be a good fit. If you have diabetes or are insulin resistant, carefully monitor how raw beet juice affects your overall health, and factor that in to how often you choose to consume it. Typically, moderation is best. Using beet kvass would appear to be a far better option, as much of the sugar is eliminated in the fermentation process. By supplying beneficial bacteria, the drink can also have a beneficial impact on diabetes and a whole host of other health problems, especially ailments rooted in gut dysfunction, and that list is a rather long one since it’s difficult to be optimally healthy if your gut microbiome is unhealthy. Join us as we march world wide against Monsanto, we are promoting a GMO free Okanagan, this is a peaceful rally, family friendly! Penticton Farmers Market April 27, 2019 at 3:30 pm – 8:00 pm 100 - 400 Block Main Street, Penticton BC The market is the biggest of it’s kind in the Okanagan with hundreds of vendors featuring handmade goods including clothing, food and jewellery, collectables, antiques and furniture, as well as live music and entertainment. Penticton Farmers Market May 4, 2019 at 3:30 pm – 8:00 pm 100 - 400 Block Main Street, Penticton BC The market is the biggest of it’s kind in the Okanagan with hundreds of vendors featuring handmade goods including clothing, food and jewellery, collectables, antiques and furniture, as well as live music and entertainment. Penticton Farmers Market May 11, 2019 at 3:30 pm – 8:00 pm 100 - 400 Block Main Street, Penticton BC The market is the biggest of it’s kind in the Okanagan with hundreds of vendors featuring handmade goods including clothing, food and jewellery, collectables, antiques and furniture, as well as live music and entertainment. Supporting Locals and giving voice to business, farmers and individuals in harmony with local values!